By nature, I’m no lover of old timey/hillbilly music, much preferring electric guitars or singer-songwriters with something to say. But, every now and again something like this comes along to test my resolve. Brothers Jack Torrey and Page Burkum – aka The Cactus Blossoms – hail from Minnesota and their music is so pure they sound like they were born and bred in an Appalachian shack. The press release and website only give a limited account of the band’s background, but I suppose that leaves the music to speak for itself and it should be very proud of itself. The production is crystal clear making the brothers’ harmonies sound beautiful on just about every track; although a couple do manage to sound a little bit samey. The Tex-Mex flavoured Adios Maria has a timeless feel to it and could easily have been a re-mastered Nitty Gritty Dirt Band track. The same could be said about Stoplight Kisses which features some pretty nifty fiddle playing from Mark ‘Razz’ Russell. 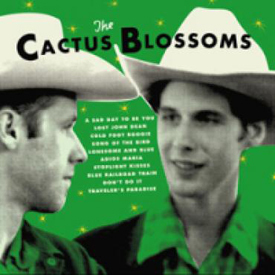 All in all this has been a delightful listen and bodes well for the Cactus Blossoms live shows, which I think should be a darn fine evening out.